Give your Audi A4 an entirely new look in day or night with a new set of Headlights! Replace your old fogged over Audi A4 B5 headlights and upgrade them with a new pair if HID headlights. These xenon HID headlights do not only give our A4 a new more modern look, but also will drastically improve the aesthetics and will allow you to drive more safely at night. These headlights will give your A4 a custom look at night that any halogen light will never be able to give you. Xenon HID lighting will restore the life to your Audi and give it a complete facelift. Our Projector kits are completely plug and play and require no complicated installations. With a bright self leveling bulbs these headlights would be a perfect addition to any A4, whether your going for a new custom/modern look or just looking to replace your outdated halogen set up. 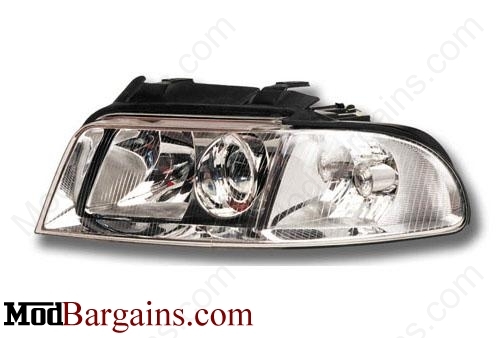 NOTE: These Headlights do not include bulbs, only the headlight housing and angel eye rings. 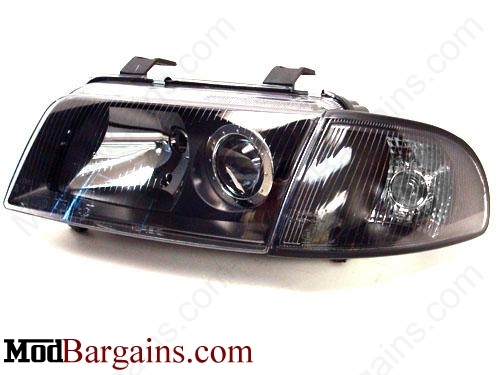 Description: OEM Headlight Replacement Xenon. 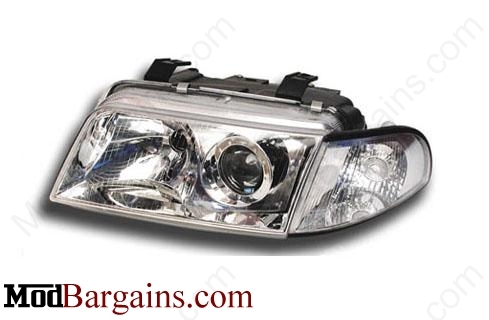 Complete Headlight replacement for your halogen headlights. No need to have your dealer reset to eliminate error on dash unlike the OEM alternative. *Vehicles model year 1994-1998.5 will require a wire harness to be made and possible shaving of the fenders for fitment. H.I.D (High Intensity Discharge) or Xenon bulbs refer to a new type of technology that relies on an electrical charge to ignite a gas inside the bulb. These bulbs do not use a filament and are named from their intense white light that they emit. Xenon headlight technology is becoming crucial from a safety standpoint. This light provides more light than conventional bulbs in a quality similar to daylight. Xenon lighting allows you to see road signs, objects, and other hazards more quickly and clearly. The risk of a car accident is twice as great during dark hours due to the fact that humans can simply not see as well. Xenon lights help compensate for overstimulation, reduction of visual acuity, loss of important information, and tiredness, and allow you to drive much more safely at night. What is a Projector Kit? A projector kit is essentially a full headlight replacement for your BMW. These headlights give you the opportunity to add Xenon Headlights for a great price and with very little hassle if your car was originally built with halogens. Our kits are directly "Plug and Play" and look just like factory Xenon headlights! 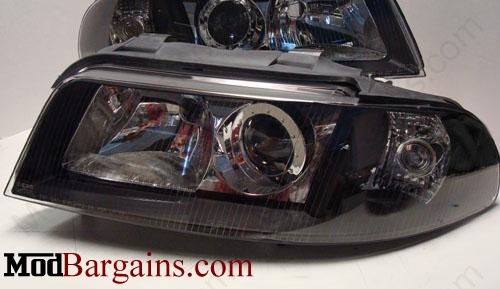 In addition you can add in the option for built in Angel Eyes to really enhance the look of your BMW. There are many great benefits to having Xenon headlights that are outlined below.